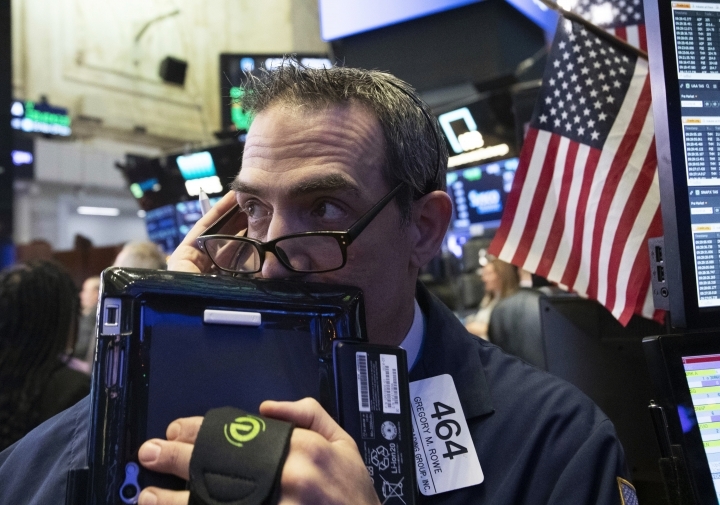 NEW YORK — U.S. stocks couldn't hang on to a big gain Wednesday, but they still finished broadly higher as technology and health care companies rose. That helped reverse some of the market's big losses from the week before. Stocks initially rallied after the Wall Street Journal reported that China's government could make changes to its "Made in China 2025" economic development plan. That could be one step toward easing dispute between the world's two largest economies. The Dow Jones Industrial Average surged as much as 458 points in morning trading, but gave later back much of that gain. "Any time you get some semblance of good news on trade, you've had this tendency to see a pretty sharp rally," said Liz Ann Sonders, chief investment strategist for Charles Schwab. After taking steep losses at the end of last week, stocks have gyrated this week: on Monday they rallied to erase a big early loss, while on Tuesday a big morning gain turned into a small decline. On Wednesday, most of the day's gains evaporated in the afternoon. The hour-to-hour changes reflect investors' nervousness about the health of the global economy: economic growth is expected to slow in 2019 and the U.S.-China trade dispute and rising interest rates could both make that slowdown more painful. Sonders said investors overlooked those threats for a time, but can't ignore them anymore. "Some of these intraday reversals have been quite extraordinary," said Sonders. "You have to go back to the financial crisis era to see ... such a big swing on consecutive days." The S&P 500 index rose 14.29 points, or 0.5 percent, to 2,651.07. The Dow gained 157.03 points, or 0.6 percent, to 24,527.27. The Nasdaq composite jumped 66.48 points, or 0.9 percent, to 7,098.31. The Russell 2000 index of smaller-company stocks added 15.19 points, or 1.1 percent, to 1,455.32. Among technology companies, chipmaker Broadcom gained 3.3 percent to $254.98. Amazon gained 1.2 percent to $1,663.54 to lead retailers, and Netflix jumped 3.6 percent to $274.88 as internet and media companies joined in the gains. Among industrials, machinery maker Caterpillar climbed 1.7 percent to $125.37 and equipment rental company United Rentals surged 6.3 percent to $108.30 after it gave strong forecasts for 2019 and said it will start buying back stock this month. Through the "Made in China 2025" initiative, Beijing aims to create leading companies in fields like artificial intelligence, electric cars and robotics. The Trump administration says the government is unfairly subsidizing Chinese companies and discriminating against foreign rivals. Along with disputes over China's handling of intellectual property, it's a significant piece of the trade tensions between the countries. Despite Wednesday's gains, almost half of the 500 stocks that make up the S&P 500 have fallen into a "bear market," meaning they have dropped at least 20 percent from their most recent peaks. The S&P 500 itself is down 9.5 percent from its record high in late September. The last bear market for the index ended in March 2009. British legislators forced a no-confidence vote in Prime Minister Theresa May, threatening an end to her tenure. She won the vote, which was revealed after the close of U.S. trading. Lawmakers within May's Conservative Party have expressed frustrations over her negotiations of Britain's departure from the European Union, and many of them want a cleaner break from the trading bloc. Opposition lawmakers don't want Britain to leave the EU. The uncertainty has knocked the British pound sharply lower in recent days, but it rose Wednesday to $1.2634 from $1.2527. The FTSE 100 stock index added 1.1 percent. Deutsche Bank jumped after Bloomberg News reported that the German government might take steps to make it easier for the struggling bank to combine with competitor Commerzbank. U.S.-traded shares of Deutsche Bank gained 8.4 percent to $9.03, but they're still down 52.5 percent this year and have fallen almost 80 percent over the past five years as the company reels from weak results and investments in Greek and Italian bonds that went bad. Commerzbank stock added 5.6 percent in Frankfurt. Bond prices slipped. The yield on the 10-year Treasury note rose to 2.91 percent from 2.88 percent. Tencent Music Entertainment, the largest music streaming service in China, climbed 7.7 percent in its first day of trading on the New York Stock Exchange. The company's IPO of 82 million shares priced at $13 a share and closed at $14 a share. Slightly more than half are being sold by the company and the rest are being sold by shareholders. The CAC 40 in France surged 2.1 percent and Germany's DAX rose 1.4 percent. Japan's benchmark Nikkei 225 jumped 2.2 percent and South Korea's Kospi rose 1.4 percent. The Hang Seng in Hong Kong added 1.6 percent. Benchmark U.S. crude oil fell 1 percent to $52.15 a barrel in New York. Brent crude, the international standard, lost 0.1 percent to $60.15 per barrel in London. Wholesale gasoline dipped 1.3 percent to $1.42 a gallon and heating oil was unchanged at $1.85 a gallon. Natural gas dropped 6.1 percent to $4.14 per 1,000 cubic feet. The dollar dipped to 113.22 yen from 113.40 yen. The euro rose to $1.1367 from $1.1325. The price of gold rose 0.2 percent to $1,250 an ounce, silver rose 1.5 percent to $14.85 an ounce and copper edged up 0.1 percent to $2.77 a pound.